This is TV. No, this is Radio. THIS IS TV. Nooooo, this is radio. Well, you may confront yourself likewise if you happen to switch to 92.7 BIG FM at 9 p.m.
At dot, you are seduced to walk down the memory lane, by a voice so very own. I asked Neelesh, “9 p.m. Prime Time !! !” “Yes”, he replied with confidence, “I’m trying my best.” He indeed is; and people are responding too. At 9, when they have hundreds of TV stations to choose from, viewers are turning into listeners, to hear some beautiful, intoxicating narrations, to re-live nostalgia. And you feel so content and composed as Neelesh takes you back in time, narrating stories of his childhood, growing up in a small town, leaving home, making it big, his isolation and the pain of migration. He shares his experiences with you and strikes a chord with the individuals who have led similar lives. 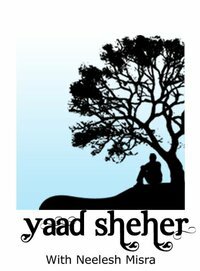 He says, “All of us, in some way or the other, are part of the imaginary city Yaad Sheher.” Yes, this town indeed is a world of some golden memories; memories that every individual wants to relive and hold on to. Having covered war, tsunami, militancy, flood, earthquake and naxalism, Neelesh has personally felt the rock-solid conscience of the nation and here, in ‘Yaad Sheher’, he tries to take the magma out to comfort his listeners. His narratives cascade through times and cities as he emerges as a fine story teller, an art he learnt while working with the American news agency Associated Press, while the background simply freezes the watch, mesmerizing you with matching themes… as if everything is happening before you… before your eyes. Also, Neelesh’s voice has both jaadoo and nasha, a combination that led him to pen the famous Jism number ‘Jaadoo Hai, Nasha Hai’. Certainly, he is a man to be watched — a man who understands the aspirations of small towns, a man who dreams of the metropolis, a man who feels the pulse of the new India and a man who respects values. “With three-fourths of Indians under the age of 35, I find these dreamers at every corner when I travel across the sidestreets and village squares of this country. They are the stories of the changing India. They are India. This is the face of the young Indian living out a new freedom – to dream, to aspire, armed with the reassurance that it is now OK to dream bigger in the new India – and those dreams could well come true,” he says. And yes, it is none other than Neelesh who can liken a barber with a painter or a classical singer. It is Neelesh who sees old grandmothers laugh like schoolgirls with two plaits. And it is also Neelesh who can hear rains. It is this Neelesh which India is listening to at 9, the prime time. “Small towns exist in each of us. We carry a small town as we make our journey through the mazes of the metropolis. And hidden inside me too, is a small town guy,” he adds. Neelesh Sir, main aapki story and dil ko chuu lene wali voice ka fan hoon. Mera sundy ka din apki story ke saath jaata hai. sir apki awaj bhut pyari h. mujhe apki kahani-phr milenge bhut achi lgi. sir m apki bhut bdi fan hu. i love your voice …. appkea kahea huea har story bohat khubsurat hota hea,par app jab kaheta ho to us storyko jan milta hea. Your story interests me, and I thank you for following my blog! Neelesh ji me aapka ek bohot bara fan hu…me ek college going studnt hu,uske sath,sath job bhi krta hu…. muje jabbhi time milta hai tab me aapka show sunta ho….. mujhe aapka sunaya huya” aalu ka paratha” sabche aacha lagatha….aap jo kahani sunate hai…..kahi na kahi aapna kahani lagta hai…. so, thanku aapko or aapke pure tem ko,hum lisiner k liye atna khubsurat sunane k liye….. frm: nabin aapkahi ek fan…..
DEAR SIR, DONT FORGET ME. B’COZ I HAVE 1 STORY ABOUT MY GRAND FATHER, SIR I WANT TO SHARE THIS STORY IN YOUR VOICE, SIR THIS IS URGENT, SO PLEASE TELL ME YOUR CONTACT NUMBER IN THIS EMAIL ID (Bunty7405@yahoo.com). SIR, DNT FORGET THIS. COZ THIS IS REAL SAD STORY ON MY GRAND FATHER’S LIFE. Hi Sir, U r my unforgotten friends, and your voice touches heart. It has become an addiction to listen to ur shows . Your stories teach us a lot and also inspired to make good relationship between our friends and knowns….like some stories is my real life ohh…..sir please call 09212150309 or email. manojg2319@gmail.com please send ur picture….? kisi ki yad mi hum tarsti hai rat mi aakh mi ashu likar tarsti hai ye aakhi aap ki ek jhalk pani ko agr didar na hua aap ka to mar hi jaunga mai mujhi na milo to mar hi jaunga mai. Hi Sir, U r awsm, and your voice touches heart. It has become an addiction to listen to ur shows and even on the YouTube for the missing show. Your stories teach us a lot and also inspired to make good relationship between our friends and knowns…. awsme stories i ❤ them all. hello nelash sir how are you. i really love your all story. if i miss any programme of your to mojhe raat bhar neend nahi aate hai. i like ur that,s stoy”JAWANI MASTANI”..
PLZ contact me on my phone no bcs i wanna lishen ur voice on phone..
Namskaar Sirji, I really like you. You never know that what you are giving me or us. Its a humble privileged to listen you and feelings of your thoughts and emotions. You know very well that “Attitude, aptitude determines Altitude”. I really love your voice, nature, compatibility, vividness and and and much more. Apko dekhe bina apki aawaz he Dil or Dimaag ko chhu jaati hain. main apse bahut kuchh batana, bahut kuchh bolna chahti hu. I am in very BIG trouble. I am not able to understand that what to do or not. If you have a time and little bit friendliness that do please contact me and tel me what to do or not. And I have much more to share with you to say. Please take care of your self for me, for every one, who have feelings about you, for you, and of you. Hay sir aapki voice me vo jadu hai ki lagata hai mai kahani dekh raha hu kuch kahaniya to meri hi jindagi judi hui lagati hai u r great sir. your show is very nice…. Neelesh ji i love ur voice. Aapke voice main ak jaadu hain. aapke bare main jitna kaha jaye utna kum hain. upar wala her kese ko ese aawaj se nahi navajta hain jese usne aapko di hain. aap jab bhi koye story sunate hain to esa lagta hain ki hum bhi uska ak hissa hain. hum bhi wahe pe hain. wo kahani nahi hakikat lagne lagte hain.